Are you to still worried about your clothes is too many to do not know how to packing it? Are you trouble in how to store the the shoes and Bra into one luggage when out for travels? Are you upset for where to put your wet towels when out of business or travel? Now here you get a solution. It is not just a clothing storage bag, also can be used as cosmetic bag, pencil bag, candy bag, book bag etc. Separating clean and dirty cloth, wet towel, washing tools, cosmetics. Protecting your cloth from wrinkle, dust and damage. 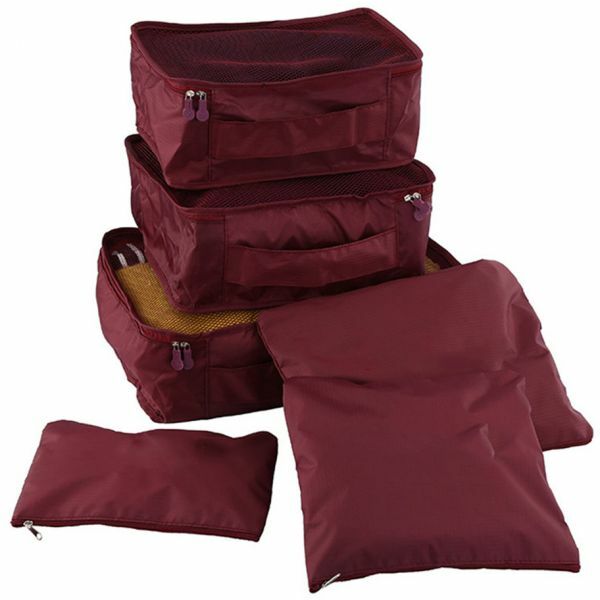 Can put all your personal care belongings in one convenient place,save your time and space. Meticulous stitching and beautiful outline, plastic pulling-head. smooth two-way zippers, breathable mesh tops that allow for excellent visibility. Sturdy lightweight handle, convenient to carry . 6 pcs with 3 fillable cubes and 3 envelopes, meet all your need. Perfect for active lifestyles including traveling, backpacking, camping, gym life, beach, or yoga.